Pear links are used often in the rigging world and can usually be used in lieu of an oblong master link if desired. 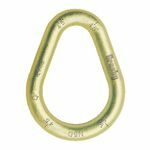 We commonly use them to build wire rope and synthetic sling assemblies. Crosby makes these A-341 pear links from alloy steel, with several sizes being forged and the rest being welded (see individual specifications for full details). Because they are made of alloy steel, they yield much higher Working Load Limits than standard pear links. Each link is individually proof-tested to 2 times the Working Load Limit with certification.